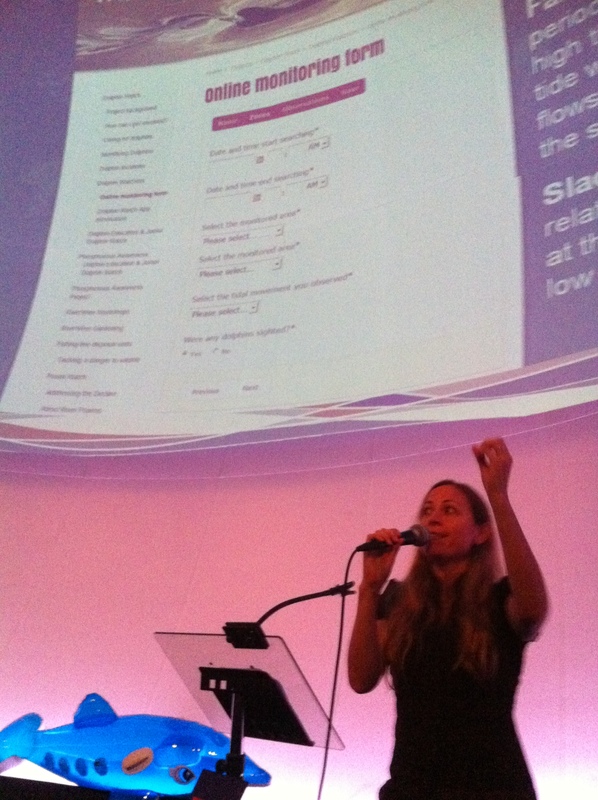 Last week I was invited to talk at the latest Dolphin Watch training event. Not that I need much of an excuse to talk about dolphins in general, but the chance to help introduce 180 new recruits to the Swan River dolphins was definitely not to be missed! The newest recruits of Dolphin Watch! I’ve discussed the Dolphin Watch project in previous posts – but for those of you not in the know, Dolphin Watch is a citizen science project monitoring the dolphins inhabiting the Swan-Canning Riverpark. It is a partnership between the Swan River Trust (SRT), Curtin University and Murdoch University which was instigated in 2009 to learn more about the bottlenose dolphins residing in the Swan and Canning Rivers. Since this river system stretches for over 60km, it would be pretty tricky for the researchers to survey alone. But by creating a network of citizen scientists, we now have eyes throughout the river park! Dolphin Watch volunteers are generally people who are regular river users – whether they are kayaking up the Canning, sailing through the Swan, or just walking along the river trails! And if they’re out by the river, then why not report the presence of dolphins? Of course, it is just as important to know which areas the dolphins are not being sighted in. This helps us to create a presence / absence map of dolphin sightings, and get a feel for what areas might be particularly important to this population. Twice a year, Dolphin Watch runs training nights for new volunteers. They get to hear about the purpose of the project, monitoring river health, some background to the dolphins, and how to collect sightings information. Plus they pick up a pretty snazzy shirt and hat combo, not to mention a tote bag full of Swan River Trust goodies! Wednesday 26th March was the first training session of 2014 down at Scitech. Speakers included Marnie Giroud (Program Manager of the SRT’s “River Guardians” program), Dr Kerry Trayler (Principle Scientists at SRT), my supervisor Dr Chandra Salgado Kent, and Piers Higgs (Director of Gaia Resources who developed the Dolphin Watch app). 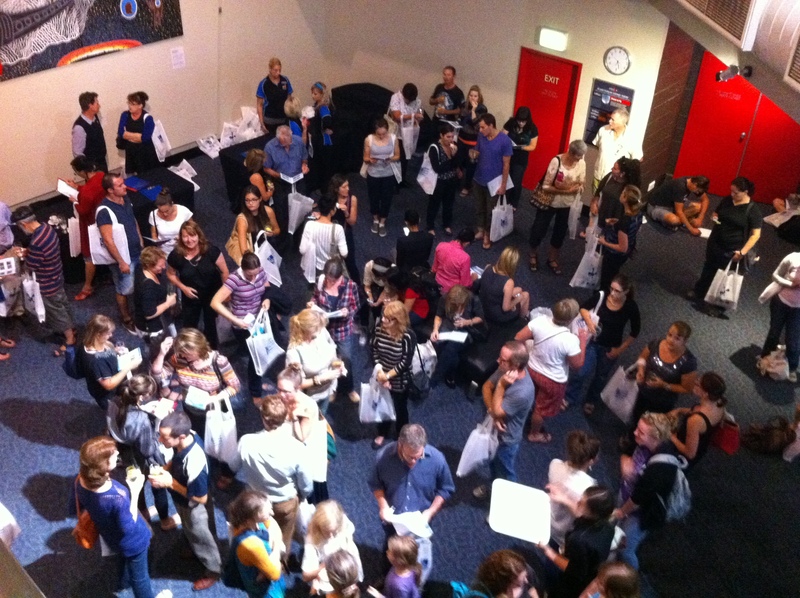 An amazing 180 new volunteers attending, bringing the total number of Dolphin Watchers to over 700 people! With only around 25 dolphins in the riverpark, we’ve got a pretty good chance of spotting them! Our next training day will be in August 2014. If you’re keen on coming along, check out the Dolphin Watch website or shoot me an email for more information! This entry was posted in Citizen Science and tagged bottlenose dolphins, Community Science, Dolphin Watch, Research, Science, Swan River on April 20, 2014 by Sarah Marley.